The Village of Pinecrest is a family friendly suburban area of slightly less than 8 square miles known for sprawling acre lots in the northern part, lush landscaping, top public and private schools and renowned system of parks including Pinecrest Gardens. It was incorporated on March 12, 1996 and is situated twenty minutes south of Downtown Miami and Miami International Airport. Henry Flagler used the land at US1 and Southwest 102 Street as a staging area during the construction of the Overseas Railroad to the Florida Keys in the early 1900s. By the 1930s, the community began to evolve around Parrot Jungle and Gardens, one of the first tourist attractions established in the Miami area. Founded in 1936 by Franz and Louise Scherr, Parrot Jungle was situated on 20 acres of property at Red Road and Southwest 112th Street. When Parrot Jungle moved to Watson Island in 2002, the property became Pinecrest Gardens. Pinecrest Gardens features over 1,000 varieties of rare and exotic tropical plants. Visitors can picnic in the gardens and spend the day exploring, listen to a lecture or enjoy a concert. Fairchild Tropical Botanic Garden, a premier conservation and education-based garden, borders Pinecrest. Fairchild attracts visitors from around the world and hosts many events and festivals such as the International Mango Festival, classes and lectures from local and global experts, the International Chocolate Festival, weddings, corporate and special events. Matheson Hammock park is located East of Pinecrest. Other parks in the Village include Coral Pine Park, Veterans Wayside Park, Suniland Park, Evelyn Greer Park, and Flagler Grove Park. Ranch-style houses are the most popular architectural style found in this community. During the 1950s and 1960s the area thrived with the expansion and construction of ranch-style homes on acre lots which laid the foundation for the community’s rural and lushly landscaped residential way. Pinecrest is known for its consistently “A” rated public elementary schools, as well as the highly regarded private Gulliver Academy & Preparatory school. Gulliver Academy is a private school that provides a traditional academic education and has four campuses ranging from PreK3 to 12th grade. Bet Shira Congregation, Kendall United Methodist, Pinecrest Presbyterian, St. Louis Covenant, and Temple Beth Am are all private schools within the Village of Pinecrest. The public schools include Palmetto Elementary, Pinecrest Elementary, Palmetto Middle, and Miami Palmetto Senior High School. The Village of Pinecrest is also making efforts to becoming a greener community and an active member of several recognized organizations such as International Council for Local Environmental Initiatives (ICLEI) and Florida Green Building Coalition. The community has a long history of environmental compassion and activism. Pinecrest has been named a Tree City USA community by the Arbor Day Foundation. Over 10,000 street trees have been planted since 1997, creating scenic green paths throughout the residential community. The Village of Pinecrest is a family friendly community with great schools and beautiful surroundings of lush tropical landscaping. 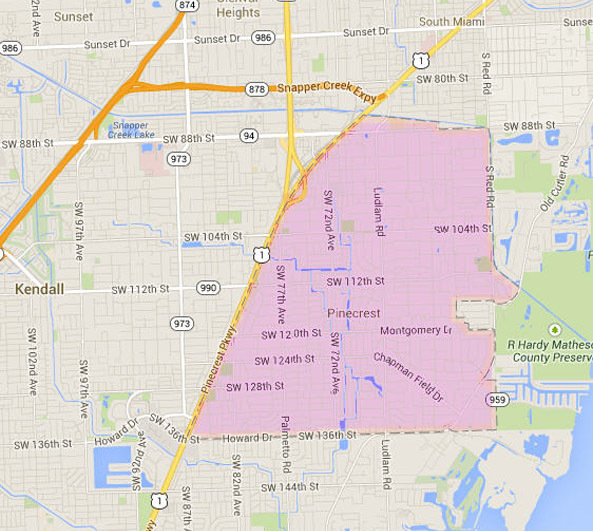 Residents can also enjoy many amenities of the Greater Miami area. Pinecrest is a desirable place to live, recognized by those who enjoy a superior quality of life in a unique green community. If you have any interest living in The Village of Pinecrest, contact us and we will assist you with your real estate needs.